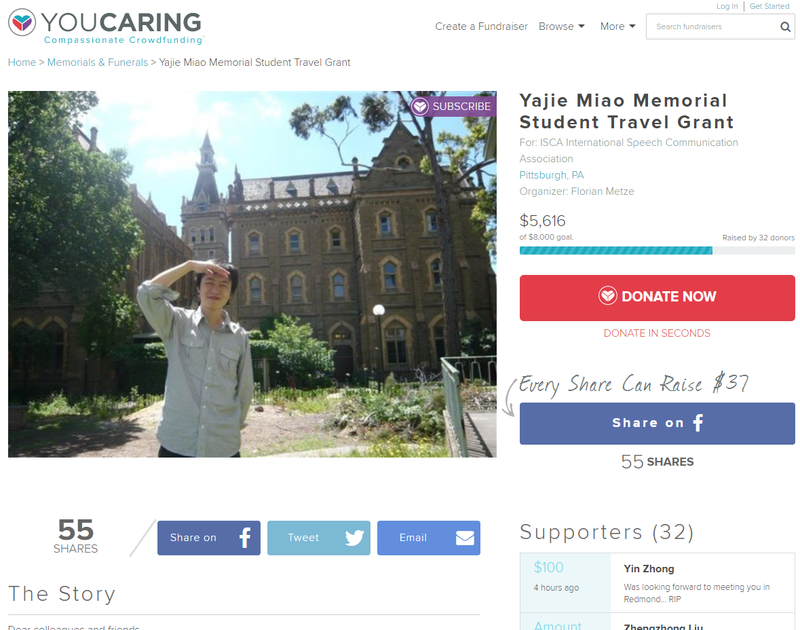 as indicated below, in my original message from November, we have now created the “Yajie Miao Memorial Student Travel Grant”. It will fund additional ISCA student travel grants for speech conferences. At future Interspeech conferences, students will be specifically selected as recipients of the Yajie Miao grant, and recognized as such at the opening or closing ceremony. ISCA has kindly volunteered to administer these grants for free. You can now contribute (yes, Interspeech is upon us!) at https://www.youcaring.com/iscainternationalspeechcommunicationassociation-815026. Donations go directly to ISCA. Even small contributions will quickly sum up to a sizable sum, and help to keep Yajie’s spirit alive at Interspeech, or other conferences. Please feel free to forward this e-mail to anyone you think might be interested in contributing.